Sealed Packed Box| Factory Unlocked Stock with Three Months Warranty|Buy with Full Confidence.. 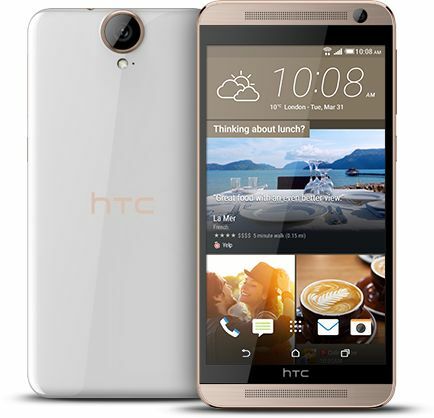 The beauty of technology is clearly viewable in the HTC One E9+ Dual SIM smartphone. This beautiful smartphone possesses a delicate and delectable design that combines the imposing and sleek quality of metallic accents with a unique chamfered edge. The phone is available in a warm classic rose gold that looks exquisite. This is followed by an impeccable mirrored polish that reflects sophistication in every surface. This includes the lustrous 5.5inch ultra HD 2K display that brings out the best in your movies and images. This screen features a pixel density of 534ppi for breathtaking clarity and sharpness. The phone has a dual SIM capability that lets you organize your personal and professional life with ease. It also features a 32GB internal storage that you can fill up with your favorite things. This brilliant device will definitely attract a few appreciative looks thanks to its classic rose gold color. It stands out yet fits in. And no phone lets you do this better than the HTC One E9+ Dual SIM smartphone. This amazing phone adopts an iconic look that is sure to get noticed. It combines sleek metallic accents with an exquisite chamfered edge. The surface of this smartphone is polished and mirrors class at every inch. This phone is the epitome of sophistication. The HTC One E9+ features advanced customizable options, and behavior learning software that go into giving you a more luxurious and intuitive experience. Get the apps you want, when you want them. The behavior detecting home screen widget automatically senses your location, combines it with your user preferences and provides apps accordingly. The phone also features a built in HTC Themes app that lets you pick the look and theme of your phone, right down to the tiniest of details. From the ringtone and wallpaper to the size of the icons, you control everything. The HTC Sense Home provides the tools and information pertaining to your location, which results in more personalized solutions and a life that gets more happening. When you have a 5.5inch Ultra HD 2K display at your disposal, there is so much to unveil. Your favorite movies, videos, and websites look infinitely realer. This screen reanimates your entertainment with a 534ppi, detailed graphics with high contrast and sharpness and resolutions that will make your jaw drop. You will now be able to stream your favorite music and videos from the HTC One E9+ to other compatible home stereo devices with the smart HTC Connect. Simply swipe your home screen with three fingers and begin; streaming was never so simple. That’s not all; this smartphone enables you to stream different music to multiple speakers at the same time. Shoot the best pictures and videos with the HTC One E9+ that has a 20MP main camera at the back as well as an UltraPixel 13MP front facing camera. You can click stunning pictures no matter what the lighting situation you’re in. These cameras are further complemented by the built in HTC Eye Experience software that gives you the ability to make adjustments to you picture. Beautify your pictures by creating your own unique effects with the enhanced editing tools that this software provides. You can track down these images just as easily with a smart One Gallery that bunches your photos and videos using easy organization and search controls. 90.4% of users recommend this product to a friend. This phone is silk, and portable, good camera quality. This telephone launched to asia market so that it not support arabic but sure support english , i take it and change the official room to the framework for UAE. In overal mobile is very good comparing with price.